How easy is it to assemble the ElliptiGO? Your ElliptiGO will arrive almost completely assembled. All you will have to put together is the steering column, front wheel and front brake assembly. For more on how to unpack your ElliptiGO, please see our Getting Started videos or contact service at service@elliptigo.com or 888.796.8227. How easy is it to ride? We’ve found that very few people are unable to ride a stand up bike the first time they get on it. Like anything new and different, it may take a few minutes to get used to, but it’s easy to ride and very stable. Watch one of our many riding videos to learn more. ElliptiGO bikes require about the same amount of balance as traditional bicycles. Watch a video of customers talking about what it’s like to ride a stand up bike. How long does it take to get comfortable on it? Most people get comfortable on their ElliptiGO bike within 5 minutes of riding it and many within 30 seconds. Watch a video of customers talking about what it’s like to ride an elliptical bike. Is it easy to ride in urban or high-traffic areas? Riding a stand up bike in urban areas is no different to riding a bicycle. The advantage that ElliptiGO stand up bikes have over traditional bicycles is that you have an elevated line of sight, giving you better visibility, making it easier for pedestrians, drivers and other cyclists to see you. Much like the standard brakes on road and mountain bikes, the braking system on your ElliptiGO bike consists of hand levers that actuate rim brakes on the front and rear wheels. How many speeds are there? We offer three elliptical bike models. The 11R model has 11 speeds, the 8C and 8S models have eight speeds, and the 3C model has three speeds. You can change gears by using a trigger shifter located on the handlebars. What type of footwear is recommended when riding the ElliptiGO? Elliptical bikes can be ridden using almost any closed-toed shoe that does not have a high-heel. We recommend wearing running shoes because they are comfortable and tend to breathe well. What are the height and weight limitations? What’s the best way to adjust it to fit me? Probably the best way to adjust the bike is to have someone look at your riding posture. If you are too hunched over, raise the handlebars. If you are reaching too far forward, rotate the handlebars back. If the stride length is too long, shorten it. What you’ll find is that there is a wide range of potentially comfortable configurations for any one rider and finding the optimal riding configuration can be done pretty quickly. ElliptiGO 3C, 8C, 8S and 11R models are equipped with a very stable, double-leg kickstand. Although it may be tempting, it is important that you DO NOT stand on the bike while it is on the kickstand. The kickstand is not designed to support more than the weight of the bike. Standing on the bike with the kickstand down can damage both the frame and kickstand, thus voiding your warranty. What kind of terrain is appropriate for an ElliptiGO stand up bicycle? ElliptiGO stand up bikes are designed for and will give optimal performance on paved surfaces. As a rule, you can ride your stand up bike anywhere you would ride a road bike; this includes paved roads, bike trails or hard-pack dirt trails. ElliptiGO bikes are not designed for off-road or trick riding. Can I use my ElliptiGO stand up bike indoors on a stationary trainer? How can an ElliptiGO bike be transported? “Gordo Trunk Rack” by Hollywood Racks – Holds 1 stand up bike. “Sport Rider 2 Heavy Duty Hitch Rack” with ElliptiGO modifications by Hollywood Racks – Holds 2 stand up bikes or 1 stand up bike and 1 regular bike. “BT-EGO Roof Rack” by Atoc – Holds 1 stand up bike per tray. Do ElliptiGO bikes fit on standard bike racks? “Sport Rider 2 Heavy Duty Hitch Rack” with ElliptiGO modifications by Hollywood Racks – Holds 2stand up bikes or 1 stand up bike and 1 regular bike. How does stand up cycling compare to other forms of exercise? The Exercise and Physical Activity Resource Center at the University of California, San Diego conducted a metabolic study to determine how riding a stand up bike compares to running and traditional cycling. They determined that stand up cycling burns, on average, 33% more calories than riding a conventional bike at the same speed. The study also found that going 16.5mph on an ElliptiGO stand up bike was equivalent in effort to running at an 8 minute per mile pace. 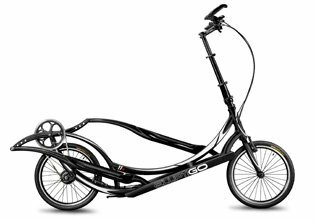 Are stand up bikes similar to recumbent bikes? Not at all. In fact, stand up bikes are sort of the opposite of recumbents. Recumbent bikes usually have a pretty big seat with a back rest, whereas stand up bikes have no seat at all. Recumbent riders pedal with their legs parallel to the ground, while stand up bike riders pedal with legs that are perpendicular to the ground. The recumbent rider’s visibility is usually limited because they are lower to the ground, making it both harder to see them and harder for them to see around obstacles like cars, bushes, walls, etc. In contrast, the stand up bike rider’s visibility is unusually good because their line of sight is elevated and their whole body is visible, making them easier for drivers, pedestrians and other cyclists to see. The high riding position also enables a stand up cyclist to see over cars, trucks and SUVs, reducing the likelihood that they will have their vision blocked by obstacles. Finally, the recumbent bike rider pushes pedals in a circle to propel their bike while the stand up bike rider takes strides that are similar to walking or running to propel the bike forward. Are there other fitness devices out there like it? We’ve never seen any. There are several different outdoor exercise vehicles that are propelled by different methods, but we’ve never seen any two-wheeled cycles designed to replicate outdoor running without the impact. There’s a three-wheeled elliptical tricycle on the market, but again, it’s quite different from the ElliptiGO. How can I test ride an ElliptiGO bike? We offer test rides at more than 300 retail locations across the U.S. To locate a dealer near you, visit our Dealer Locator. You can also sign up for a test ride with your closest dealer. International customers can find the distributor for their country here. How can I get my ElliptiGO bike serviced? ElliptiGO bikes use industry-standard components that can be repaired or serviced by a technician who is trained to service bicycles. The custom parts are the frame, steering column, drive arms and adjustable crank assembly, which can also be repaired or replaced by a trained bicycle technician. Depending on your region, there may be a designated service location, or we will work with you to find a resource in your area who is willing to service or repair your elliptical bike. Contact us first with any service issue so we can work with you to get it resolved as quickly as possible. You can reach our service department at service@elliptigo.com or by calling 888.796.8227. How do I maintain my ElliptiGO bike? Like any bicycle or other piece of fitness equipment, your elliptical bike must be properly maintained to give you the best performance. Cleaning the tracks and load wheels before or after every ride, ensuring the chain is lubricated, the tires are properly inflated, the brakes are functioning correctly, and all of the other components are working properly will help ensure a smooth operating performance. For more details on how to clean and maintain your bike, please watch our maintenance videos. When will each part wear out and need to be replaced? The lifespan of any given component on your bike depends on a range of factors, including rider weight, frequency of riding, duration of rides, riding surface, style and intensity of riding, climatic conditions when riding and in storage, and diligence with maintenance and servicing. Certain parts, such as brakes, tires, tubes, rims and cables will likely wear more quickly than others, like the tracks and load wheels, hubs and fork. We have prepared a Service Guide to provide some insight into when you should expect to replace the various parts. Should I lubricate the tracks? No. The track inserts and load wheels are manufactured with lubrication already in them, which helps them roll in a smooth motion. Adding any sort of additional lubrication could cause the load wheels not to spin properly and could cause the drive arms to slip when pedaling. Adding lubricants will also cause more dust and dirt to be collected, which could lead to accelerated wearing of the track inserts and/or load wheels. Wiping down the tracks and load wheels with a slightly damp cloth before or after every ride to remove any debris is the best way to keep the tracks and wheels running smoothly. The serial number is an 8-digit located on the round tube, between the rear wheel and the kickstand, just below the ElliptiGO patent stamp as shown in the photo.